Prime Minister Justin Trudeau and now Veterans Affairs Minister Jody Wilson-Raybould at Rideau Hall on Monday, Jan. 14, 2019. 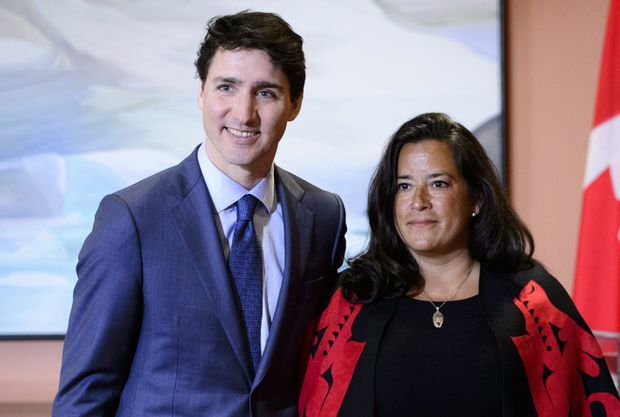 Re PMO Pressed Justice Minister To Abandon Prosecution Of SNC-Lavalin (Feb. 7): In one brave move, former justice minister Jody Wilson-Raybould simultaneously renewed my faith in politicians and reinforced the notion that politicians are only interested in power. Assuming the allegation is true, it appears that despite knowing that her political career would be negatively impacted by her decision to stand up for what is right in refusing to intervene in the prosecution of construction giant SNC-Lavalin Group Inc., she refused to go against her principles. On the other hand, the Liberals, using an abominable omnibus bill to present the budget, changed the Criminal Code to allow remediation agreements – the kind of agreement SNC-Lavlin wants to negotiate to avoid prosecution on charges of fraud and corruption. How discouraging. Some sunny ways by Justin Trudeau. Jody Wilson-Raybould for PM! There is a difference between the principle of judicial independence, and the presumed independence of the Justice Department. The former is real and historical, the latter is not and is chimerical. Government lawyers know their decision to prosecute an offender or to settle a live case is subject to review and approval by higher-ups. In respect to Kathleen Roussel, director of the Public Prosecution Service, that would be the attorney-general, who reports to cabinet. Indeed, as the article states, this is confirmed on the Public Prosecution Service’s website. Similarly, for lawyers in Crown corporations, it would be the general counsel, who typically reports to a board of directors or the CEO. In neither case should a justiciable outcome be altered. That makes this report, with respect, a tempest in a teapot and belies its headline. It would seem, more properly, that the PMO didn’t ask the former A-G to abandon the case, but simply to exercise her lawful power to invoke an alternative to prosecution. This would in no way alter the ultimate outcome of establishing and sanctioning SNC-Lavalin’s culpability, which would be improper, and would impose a form of diversion that would preserve the viability of this important company. These two results are in the country’s interests, and are entirely consistent with the Justice Department’s mandate. Sean Michael Kennedy, former government lawyer, Oakville, Ont. How hypocritical of the Trudeau Liberals to maintain the façade that we don’t let politics interfere with the justice system. I guess political interference depends on whose interests are at play. In the Huawei and Meng Wanzhou case, it’s the United States’ interests, while in the SNC-Lavalin case, it’s Quebec interests and the Liberals’ re-election prospects at play. Goody-two-shoes Canada sends in the RCMP after SNC-Lavalin vies for a contract in Libya. Apparently, the company stooped to the level where the client nation, and everyone in the running, does business. Justice wishes to make an example. The PMO suggests taking it easy. News flash: This sanctimonious environment is poisoning the national currency, diverting resources from “serve and protect” to harry and harass, and generally alienating anyone wishing to establish significant operations in Canada. If Canada wants universal health care, paid vacations, parental leave, and job security, then it is inappropriate to bite the hand that feeds us. Re Toronto Does Not Consent To Ontario'’s Proposed Subway Takeover (Feb. 6): John Sewell’s analysis of Ontario law relevant to Premier Doug Ford’s desire to take over the transit system of Canada’s largest city (in particular, Ontario’s Expropriation Act) doesn’t deal with an essential issue. If municipalities in law exist at the pleasure of the government of their province under our Constitution (recall the recent halving of Toronto’s City Council by a provincial law), Ontario could pass a special takeover statute for the Toronto Transit Commission. It would include an exemption from application of both its own Expropriation Act and any other law of Ontario which conflicts with that special statute. Re Canada’s Leadership On Venezuela Is Misguided – And A Mistake (Feb. 6): In my view, it’s professors’ John Kirk and Stephen Kimber’s opinion that is misguided, misdirected and a mistake. Misguided because it does not pay enough attention to the history of Venezuela in the past 20 years, and seems to ignore the fact that the steps taken by Juan Guaido, the National Assembly and the great majority Venezuelans have been in accordance with Venezuela’s Constitution. Misdirected because the accusations of intervention in Venezuela’s internal affairs should have been directed to the governments of Cuba, Russia, China, Turkey, Iran (Hezbollah), and ELN and FARC Colombian guerrillas, whose illegal presence and illicit deals with the Maduro administration have violated Venezuela’s sovereignty and Constitution. And a mistake, because the authors are trying to discredit the interim president, Juan Guaido, the members of the National Assembly, and the heroic efforts and sacrifice of the many Venezuelans who have worked so hard to get rid of the dictatorship by peaceful, electoral means. This resistance movement, made in Venezuela, has been brewing for 20 years, finally consolidating and achieving long-overdue support from the international community. In their zeal to slam the Liberal government, the professors have not paid the attention they should to the suffering of the Venezuelan people and their right to democracy and freedom. Avoiding meddling in the internal affairs of others has been a constant in Canadian foreign policy since the Second World War. Our current activism ignores the implications and consequences of the slippery slope down which we are now embarked. Where next? Repugnant and disreputable regimes abound. Are we ready to take on Poland? Hungary? Russia? Do we get any tangible benefits, such as U.S. tariff removal on steel and aluminum, for fronting an initiative so closely aligned with U.S. attitudes, as witnessed by the Venezuela segment of the State of the Union address? Regrettable, but much of a piece in the overall mismanagement of our international relations by this government. Re Crossing Boarders (Pursuits, Feb. 2): Your article about ski resorts, and the conflicts between skiers and snowboarders, does not address the reality that skiers and snowboarders turn with a different frequency. As a snowboarder, I always give skiers a wide berth, as the only predictable thing about their descent is that they will turn (in front of you) … when you are least expecting it. John McConnell, Central Hainesville, N.B.